This post is sponsored in conjunction with ChristmasSweetsWeek. I received product samples from sponsor companies to aid in the creation of the ChristmasSweetsWeek recipes. All opinions are mine alone. This Overnight Caramel French Toast, made with store-bought caramel topping, is easy to assemble the night before, sweet, and perfect for Christmas morning. Welcome to #ChristmasSweetsWeek 2018 hosted by Terri from Love and Confections and Christie from A Kitchen Hoor’s Adventures! What better way to celebrate the holidays than with food and a fun giveaway? 44 bloggers from around the country have come together to share over 180 sweet Christmas recipes!! Deck the halls and get ready for very merry sweet treats, like fudge, cookies, Christmas morning breakfasts, layer cakes, martinis, cocoa, and more! Our #ChristmasSweetsWeek sponsors are helping us give away some great prizes. Thank you so much, Sponsors, for your generosity. We have an incredible giveaway below and would love if you would take a moment to read about it and what you can win! 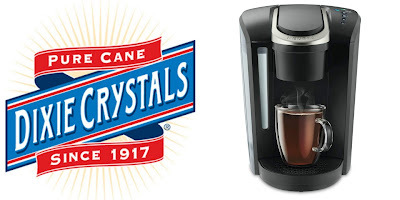 Dixie Crystals is giving one winner a Keurig K-Select Single-Serve K-Cup Pod Coffee Maker. 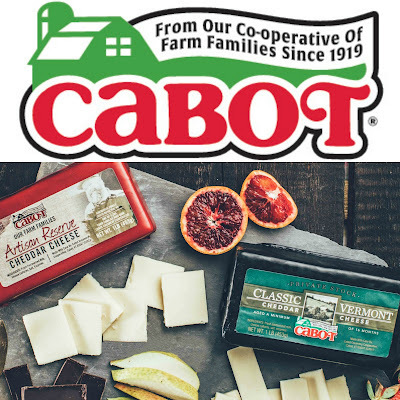 Cabot is giving one winner a cheese gift set, including a Cabot Cheese slate cutting board, small cheese cleaver, Cabot custom Bee’s Wrap, an assortment of Cabot’s finest cheeses. 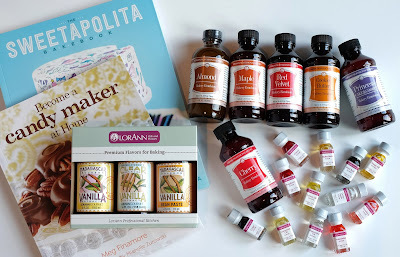 LorAnn is giving one winner a collection of 6 LorAnn Bakery Emulsions, a collection of three LorAnn Oils vanilla extracts, a candy making cookbook, The Sweetapolita Bakebook, and a 12-unit variety pack of LorAnn super-strength candy oils. Our flavors. Your creations. For over 50 years, LorAnn Oils has been supplying professionals and home chefs with the finest quality candy and baking flavors, essential oils, and specialty ingredients. Visit us at LorAnn Oils & Flavors to shop, learn, and discover new recipe ideas. 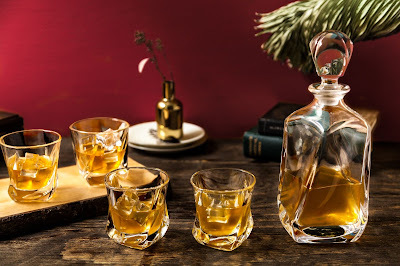 Joyjolt is giving one winner an Aurora Whiskey Decanter Set. Our Aurora Whiskey Decanter set has a timeless and sophisticated design that adds both class and style to any table. This set is hand made with top quality lead free crystal glass and cutting edge materials. The sets quality, design and upscale packaging makes the Aurora a perfect addition to your home, bar, hotel, restaurant, club or office. DRINK WITH JOY. ENJOY THE JOURNEY. Here at JoyJolt we believe that so many of the moments you enjoy most include raising a glass. From the jolt you get from that first sip of coffee in the morning to toasting a milestone with close friends. That’s why we have created glassware equally as special and unique as your happiest moments. 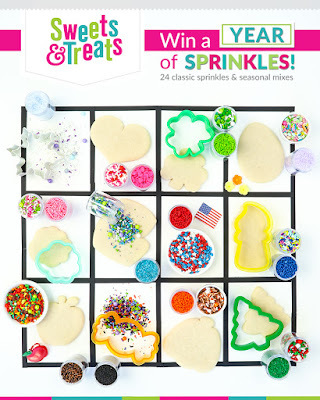 Sweets & Treats is giving one winner the Year of Sprinkles Box at a $150 value. It contains holiday mixes, classic sprinkles, and some of their most popular sprinkles. Sweets & Treats, a party and baking supplies manufacturer and wholesaler, started out of a baking industry need for truly greaseproof cupcake liners. 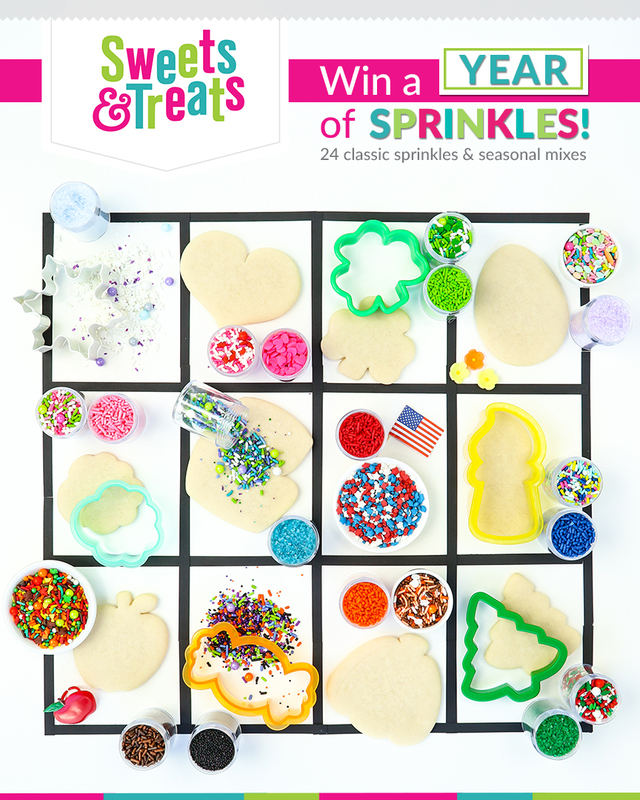 From there, the company expanded into a handful of specialized categories including the latest, Sweet Sprinkles, their one of a kind sprinkles and sprinkle mix line. With hundreds of truly unique products, they are a one stop shop for your next party! Torani is giving one winner a year supply of Torani: 12-750ml glass bottles, flavors will be winner’s choice, plus pumps for each bottle. Torani inspires you to taste life, one flavorful experience at a time. Even though people all over the world recognize our iconic Torani bottle, we’ve remained a family-owned company — adhering to the high quality standards that Rinaldo and Ezilda set over 90 years ago. Each and every syrup, sauce, and smoothie is created with care and pride. Way back we started with just five syrups. 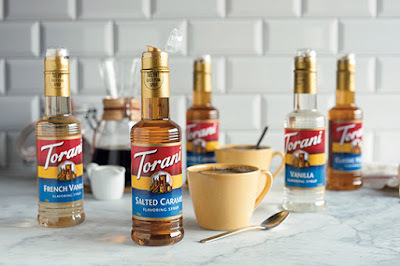 Today, you can use more than 100 of our naturally flavored syrups, sauces and beverage bases in coffees, sodas, teas, smoothies, cocktails and more. And we’re excited to bring you new taste traditions and flavors as we move forward. 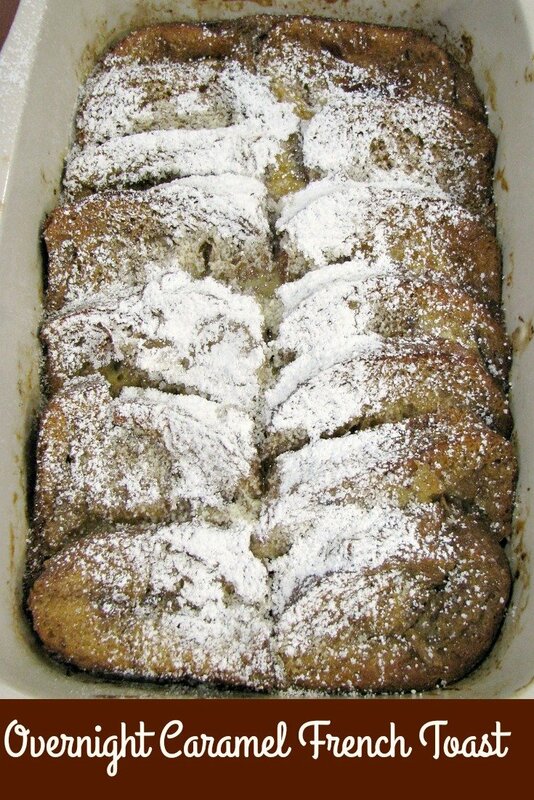 Grease a 9×12 or similar size baking dish with butter. 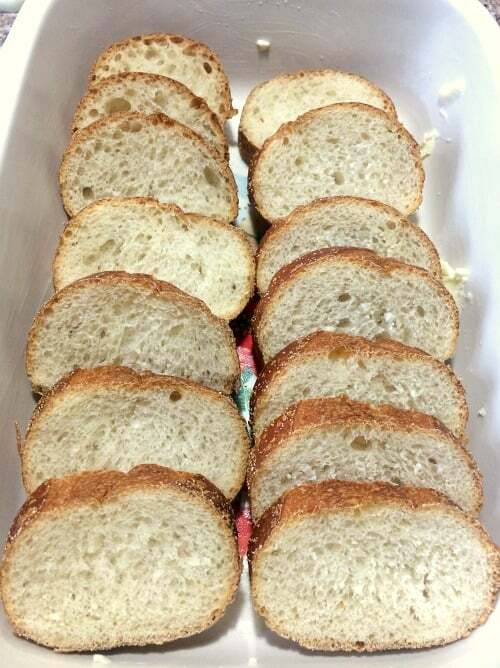 Slice 10-12 slices of French bread 1/2 inch thick and place in the baking pan. In a mixing bowl, combine 6 eggs, caramel topping, cinnamon, and vanilla. Pour the mixture over the bread. Turn the pieces of bread to fully coat in the egg mixture. Cover and refrigerate for at least 8 hours. The next morning bring the casserole out of the refrigerator while you preheat the oven to 350. 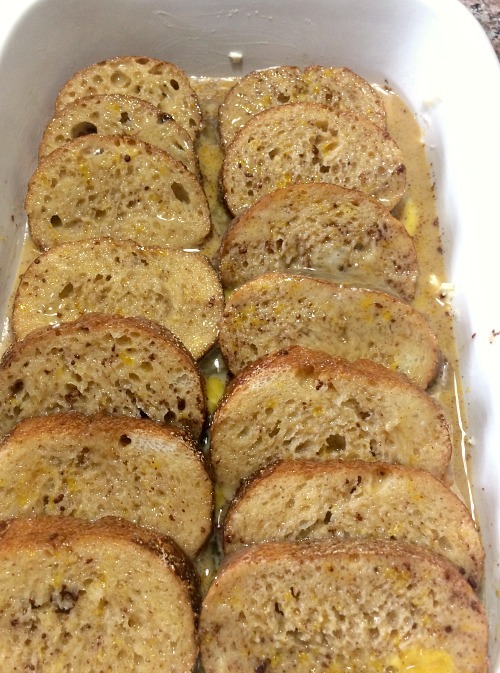 Drizzle the bread with melted butter. Bake for about 45 minutes or until cooked through. Sprinkle with powdered sugar before serving. I made one mistake while preparing this oven baked caramel French toast that you can see in the photos, but it worked out okay. I overlapped the bread after turning it to fully soak up the egg mixture, not thinking that doing that would cause the covered parts of the bread longer to fully cook. It turned out fine, but I would recommend not overlapping much if you can help it. This recipe is inspired by Pennsylvania Bed and Breakfast Cookbook “Caramel French Toast Baked”. Read on after the Overnight Caramel French Toast recipe to see all the other #ChristmasSweetsWeek recipes shared today and enter the giveaway! WANT EVEN MORE DELICIOUS RECIPES FROM MYSELF AND MY FAVORITE FOOD BLOGGERS? FOLLOW RANTS FROM MY CRAZY KITCHEN ON PINTEREST, FACEBOOK, TWITTER, OR INSTAGRAM, WHERE I SHARE NEW RECIPES DAILY. YOU CAN ALSO SUBSCRIBE BY EMAIL TO GET NEWLY POSTED RECIPES FOR FREE! This Overnight Caramel French Toast, made with store-bought caramel topping, is easy to assemble the night before, sweet, and perfect for Christmas morning. Grease a 9x13 baking dish with butter or cooking spray. 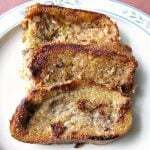 Place the sliced bread in the baking dish, overlapping only if necessary. In a large mixing bowl, combine the eggs, milk, caramel topping, vanilla, and cinnamon. Whisk well and pour over the bread. Cover the baking dish with plastic wrap and refrigerate overnight, or for at least 8 hours. The next morning, bring the casserole out of the refrigerator while you preheat the oven to 350 F. Drizzle the melted butter over the bread. Bake for 45 minutes or until cooked through. No Bake Peppermint Eggnog Pie from Who Needs A Cape? Thank you ChristmasSweetsWeek Sponsors: Dixie Crystals, Cabot Cheese, Lorann Oils & Flavors, Torani, Joyjolt, and Sweets & Treats Boutique for providing the prizes free of charge. These companies also provided the bloggers with samples and product to use for ChristmasSweetsWeek recipes. All opinions are my own. Favorite treat to make is decorated cut out sugar cookies.